Home > Sports > Basketball > Worrying times for Dragons as they fall to sixth straight defeat. 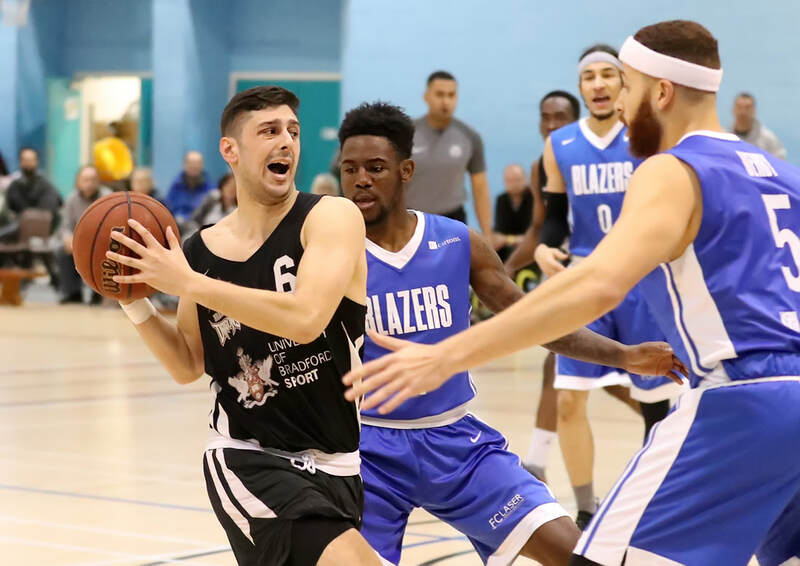 It’s a situation that would not have been considered possible when Bradford Dragons got off to their best ever start to a National Basketball League division one season, with seven straight wins across all competitions. 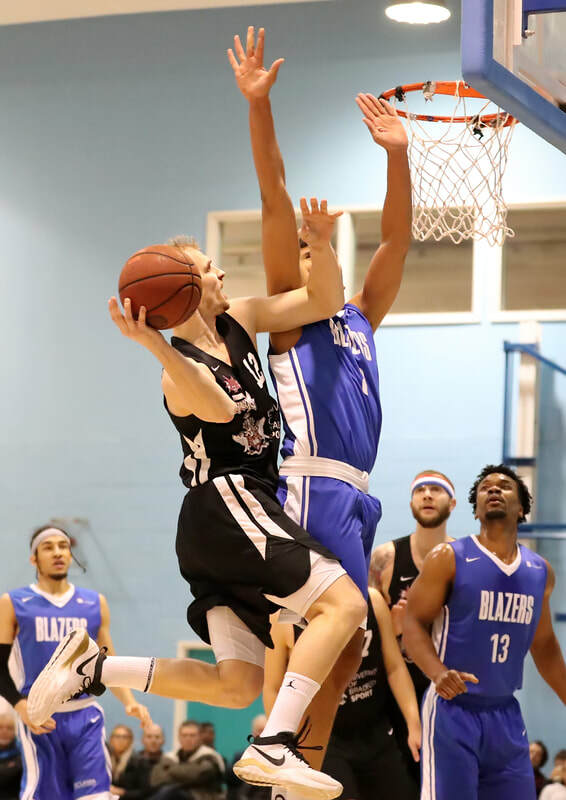 But, a drastic twist of fortune which has now seen six straight defeats – the latest of which was a home fixture against Derby Trailblazers (90-104) on Saturday evening – and only winning one from their last nine, sees them now firmly entrenched in a battle against relegation. Some would say that circumstances have conspired against the Dragons this season and it must be said that the sudden loss of American Point Guard, Drexler Clark, has been a significant factor in their downfall. However, the remaining players have also demonstrated their potential, not least by beating top of the league, Team Solent Kestrels, in the final game of 2018. Perhaps that result played a part in Chris Mellor’s decision not to replace Clark before the transfer window closed at the end of January; however, time will tell whether, or not, that is a decision he lives to regret. The hard facts are that the Dragons now sit in eleventh position in the league, just two places and two points above the relegation spots. The current roster is certainly capable of better than we have seen from them recently, but unless they can muster up a quick return to form, the prognosis looks bleak. 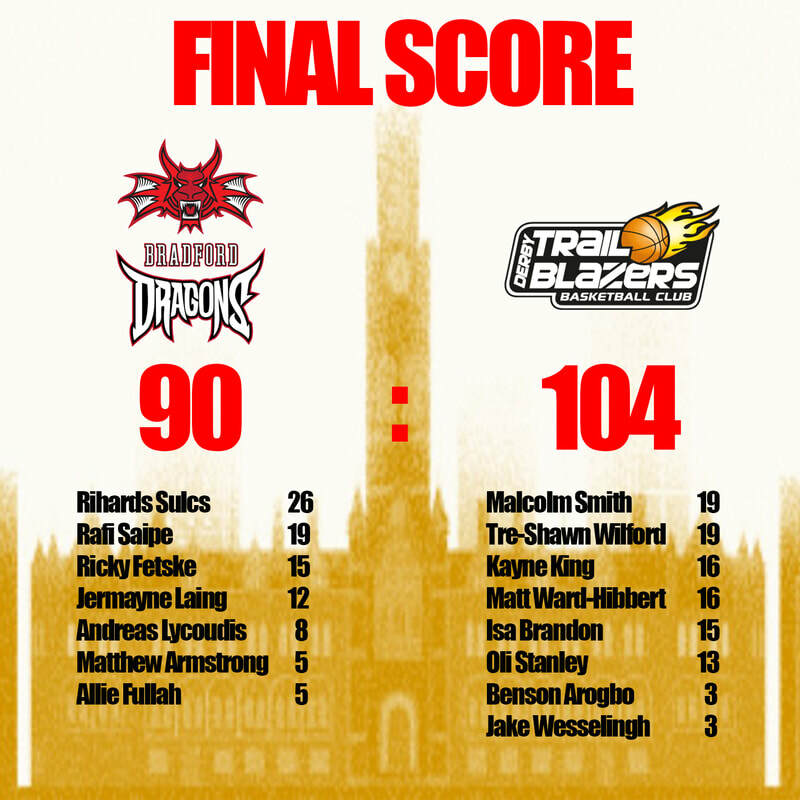 The Trailblazers were the team that ended the Dragons unbeaten start to the season, when the sides last met at the end of October. Prior to the weekends fixtures they sat fifth in the table, below Loughborough and Thames Valley only on points difference. It was them that recorded the opening score of the game, a two-point layup from club captain Oli Stanley. Ricky Fetske quickly levelled for the Dragons but then a couple of quick scores from Tre-Shawn Wilford gave Derby the first clear lead of the game. ​Bradford came back and with five minutes played the scores were level. The hosts just had the edge for the remainder of the first quarter, which they finished with a two point advantage (22-20). Derby levelled the tie at the start of the second, and the game stayed close for the opening three minutes of the quarter. However, Derby then started to stamp their authority on the game and went about opening up an eight-point advantage (32-40), with little more than four minutes of the half remaining. Bradford responded, pulling the scores back within a single point (39-40), including a three from Rafi Saipe. However, Derby pulled clear again and, at the end of the half, they were in control of a ten-point advantage (41-51). The third quarter was once again Derby’s, who quickly increased their lead to fourteen at the resumption of play. The closed that the home sid got was within eight points (51-59) whilst the Trailblazers pulled further away and with only twelve seconds of the penultimate quarter to play Kayne King hit a three to put the visitors twenty points clear. Rihards Šulcs responded with another three, just before the buzzer, but Derby went into the final ten minutes seventeen points clear (63-80). The largest lead of the game with seven and a half minutes on the clock, when Wilford sank a lay-up to put his side 24 points clear (65-89). Bradford stuck at it however and reduced the deficit to only 14 points by the end of the game (90-104). Derby travelled home with the win, which at least for now moved them into third in the league. Šulcs led the line for the Dragons, hitting a game high 26 points and adding 11 rebounds to record yet another double-double this season. 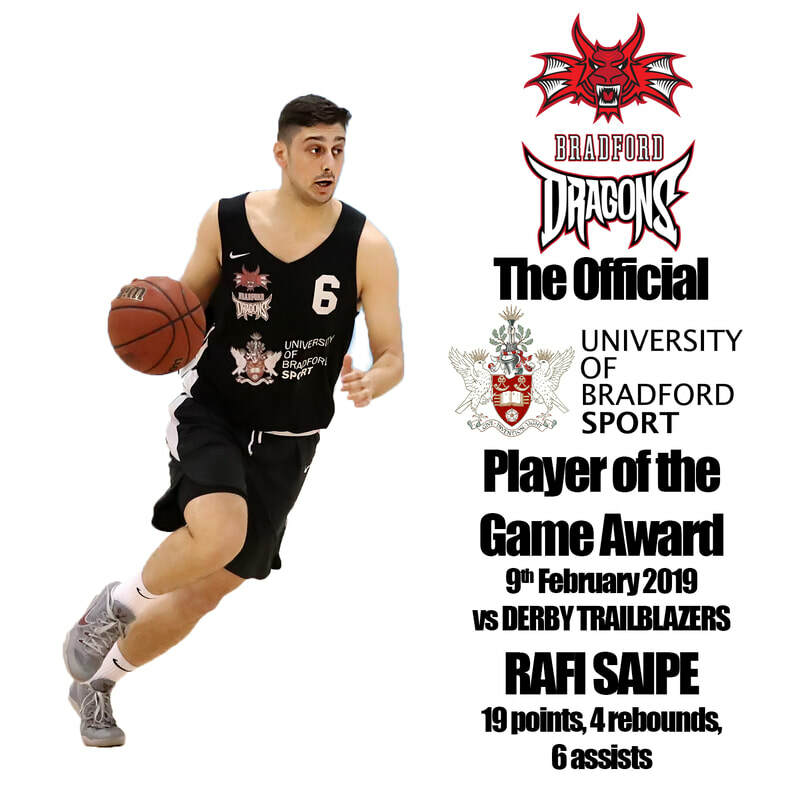 Rafi Saipe picked up the University of Bradford Player of the Game Award, contributing 18 points, 4 rebounds and 6 assists to the team statistics, whilst Ricky Fetske also recorded a double-double, with 15 points and 13 rebounds. The Dragons now face a tough road trip to Reading Rockets next Saturday, before then starting a crucial period, with three fixtures against teams around them in the table – Hemel Storm (Home, 23 February), Leicester Warriors (Home, 24 February) and Team Newcastle University (Away, 2 March).